Well I finished this mosaic a few minutes ago. Wow, what a ton of work and it's not perfect. I need to re-shoot one of the sections. Looks like I missed focus a touch, plus a couple of the sections didn't stack perfectly on the finer circuits. Not sure why. Just don't feel like screwing with it any longer tonight. <g> Stacking was done with CombineZP. 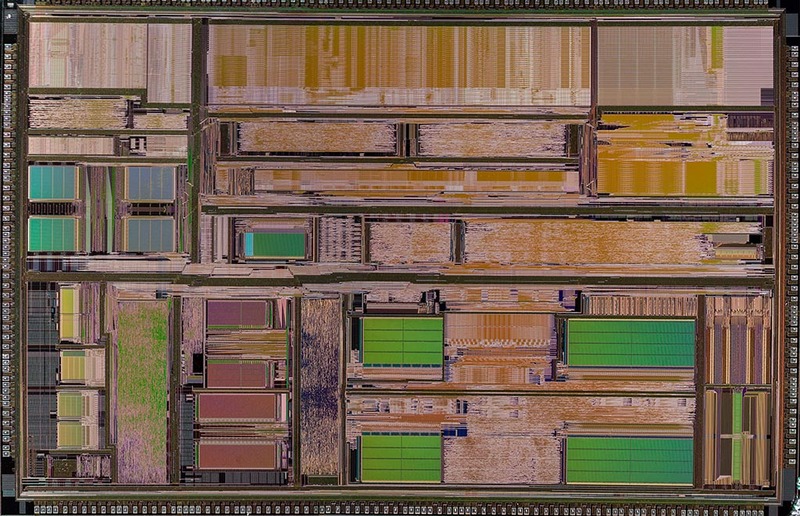 The CPU was photographed in 6 sections. each section had about 16 images stacked. The below link is ONE section at FULL SIZE. You can pan around with the sliders on the bottom and right size once there. I think this image is pretty impressive. The below link is the FULL image but at half the original size. You can pan around with the sliders on the bottom and right size once there. Looks like you have added a lot of efforts for the shot. Pretty good images though. Probably my last attempt. I did re-shoot one sections but there are still a few issues. This particular one was stacked with Zerene. It's about 75% of the original. As I mentioned above, you can navigate the image with the slider located on the bottom and right of the screen once there. I've found with these large chips doing massive stacking and stitching efforts often leads to sections that don't line up when stitching. Turning OFF all stacking alignment parameters helped and using telecentric lenses, or close to telecentric, also helped. Where do you get your die from, are these on a wafer? Thanks Mike. I'm sure I could nail this with my current setup if I dedicate more time to it and try a little harder. I'm in the middle of making a TON of Christmas presents and tried to sneak this in while taking a needed break. No, this isn't a wafer ... I wish I had one for this particular CPU. I purchased it on eBay. It's a die and quite dirty (and yes I've tried cleaning it with painters tape). <g> That being the case, there is a ton of clean up to do in Photoshop. Nice image -- a lot of good technique in here! I moved this thread from Nature to Technical & Studio.